The glow setting spray edit featuring Pixi, Glamglow & more! Setting sprays have been a regular feature in my daily makeup for years (MAC Fix+ or Urban Decay All Nighter Spray) because I have dry skin and until recently, I hadn't found any setting powders that didn't accentuate my dry skin and make me look 10 years older (that's now changed, thanks to Hourglass). More recently, I have seen the release of setting sprays that also add some glow to the skin and I am hooked! 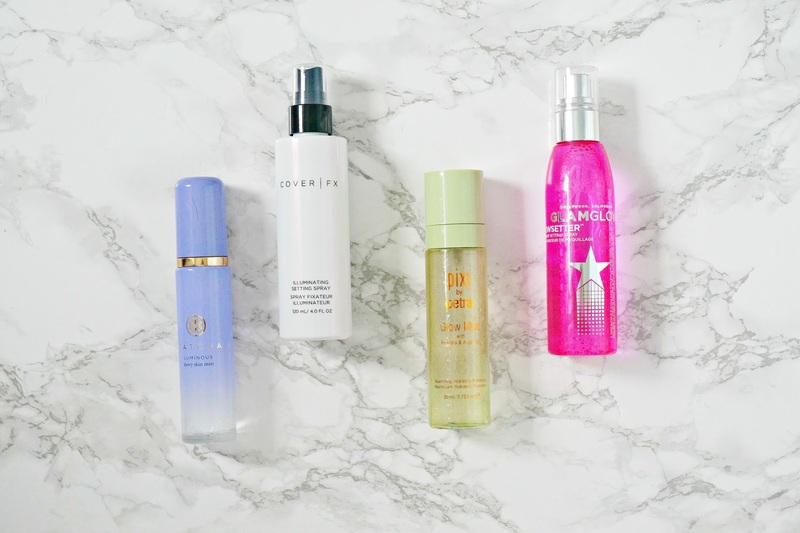 Today I am sharing my thoughts on four glow setting sprays that are currently in my collection and hopefully it will help you choose one if you are looking into adding one to your collection! Tatcha Luminous Dewy Skin Mist: I absolutely adore this product because it acts like an Instagram filter on my skin. I use this as a finishing touch to my base before I apply mascara/eye makeup etc because it really ups the luminosity of my skin but it makes my mascara smudge a little if I spray over my entire makeup. It isn't really what I would call a setting spray as it doesn't necessarily add to the wear time of my makeup but it really softens the look of my base. I would recommend this to anybody with dry skin, who wants to achieve a dewy finish. The mist is very fine, which I love and this would also be ideal as part of a skincare regime but it's more expensive than my usual hydrating mists so I don't use it in that way and just keep it for adding luminosity to my base. It is housed in a glass bottle so not the most convenient for the handbag. Out of the four mentioned here today, this adds the dewiest finish. $48. Pixi Glow Mist: This product can be used as a primer, setting spray or refreshing skin mist throughout the day. It contains a blend of 13 natural oils plus propolis, aloe vera and fruit extracts, all of which combine to deliver some hydration (without being greasy) to the skin whilst adding a glow. It needs to be shaken before use to mix the ingredients and the mist is quite fine so it won't disturb your base, but as with all sprays, I hold at a distance when using. The plastic bottle means it isn't too heavy so can easily be carried in a handbag for refreshing throughout the day. This doesn't add to the wear time of my base but it also doesn't reduce the wear time - it adds glow but isn't a setting spray in my eyes. £16/€20.95/$15. GlamGlow Glowsetter Spray: A recent addition to my collection - I have tried all of the Glamglow masks so when I saw that they had released a setting spray, it was inevitable that it would be added to my basket! The bright pink packaging might be to everybody's taste but I quite like it and the plastic bottle means that it isn't very heavy. The first thing you will notice when you spray this product is the scent - very sweet, vanilla type scent. I am not crazy about it but it soon dissipates so I can get over it. The mist is very fine and the result is that the base looks glowy but not dewy and never runs the risk of verging into greasy looking. This acts really well as a setting spray because it extends the wear time of my base, making it perfect for those with combination, normal and dry skin. $32 but is also available in a mini bottle for $16. Cover Fx Illuminating Setting Spray: This has the finest mist of all of the sprays so there is no chance of it disturbing base makeup. It is alcohol free and feels quite soothing on the skin. This spray adds some luminosity to the skin without being too glowy and it works really well as a setting spray - my base does not budge at all when I wear this spray. There is no scent from this product at all and you really cannot feel an extra layer of anything on the skin with this spray. This will be the one that I reach for throughout summer when I need the assurance of my base being set, without looking flat. They also sell a mattifying option for those with oily skin. £22/€24/$31 but also available in a mini travel size bottle for $15. The Tatcha option adds the most dewiness to the skin, the Pixi option adds glow, rather than dewiness, the Glamglow option adds subtle glow but also extends wear time and the Cover Fx option adds luminosity and secures the base. The Glamglow & Cover Fx options could be re-applied during the day without disturbing the base, if required and the Tatcha & Pixi Sprays could also be re-applied during the day to refresh makeup but you would have to ensure the eye area was avoided. Do you use setting sprays? Do you prefer mattifying or traditional setting sprays to those that add glow? I would love to hear in the comments below!